Oxford University Press, USA, 9780190239039, 336pp. China's Economy: What Everyone Needs to Know(R) is a concise introduction to the most astonishing economic growth story of the last three decades. In the 1980s China was an impoverished backwater, struggling to escape the political turmoil and economic mismanagement of the Mao era. Today it is the world's second biggest economy, the largest manufacturing and trading nation, the consumer of half the world's steel and coal, the biggest source of international tourists, and one of the most influential investors in developing countries from southeast Asia to Africa to Latin America. How did China grow so fast for so long? Can it keep growing and still solve its problems of environmental damage, fast-rising debt and rampant corruption? How long can its vibrant economy co-exist with the repressive one-party state? What do China's changes mean for the rest of the world? 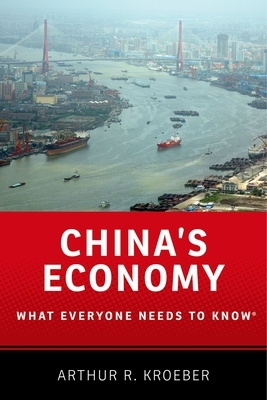 China's Economy: What Everyone Needs to Know(R) answers these questions in straightforward language that you don't need to be an economist to understand, but with a wealth of detail drawn from academic research, interviews with dozens of company executives and policy makers, and a quarter-century of personal experience. Whether you're doing business in China, negotiating with its government officials, or a student trying to navigate the complexities of this fascinating and diverse country, this is the one book that will tell you everything you need to know about how China works, where it came from and where it's going. Arthur R. Kroeber is founding partner of Gavekal Dragonomics, a China-focused economic research consultancy he established in Beijing in 2002 after 15 years as a freelance financial journalist in Asia, and editor of its flagship publication China Economic Quarterly. He is also head of research at the firm's parent company Gavekal, where he advises financial, corporate and government clients on economic and political developments in China. Kroeber is a senior non-resident fellow of the Brookings-Tsinghua Center for Public Policy, adjunct professor at Columbia University's School of International and Public Affairs, and a member of the National Committee on US-China relations. He lives in Beijing and New York.